Take advantage of low off-season mid-week rates and seasonal activities for group stays during this time period. SPRINGTIME ARTS GETAWAY – THE BEACH AND BEYOND! Get acquainted at a Welcome Dinner tonight at your hotel and enjoy toe tapping entertainment provided by the Doorway Singers. Depart with your local guide on a Welcome to Virginia Beach Tour, see the Cape Henry Lighthouses –guarding the entrance to the Capes for over 200 years, walk out on the Overlook at First Landing Park for picturesque views, trace the footsteps of early colonists who claimed this land for England in 1607. Drive by exclusive homes in Virginia Beach’s prestigious North End and get the pulse on current day happenings as you ride down the famous resort strip. Return to the hotel to enjoy free time – stroll along the beach, dip your toes in the blue waters of the Atlantic and enjoy lunch on your own at the Boardwalk. A visit to the Virginia Aquarium this afternoon features komodo dragons and exciting IMAX films! Dinner tonight included at a waterfront restaurant with scenic view and delicious local cuisine. Spend the morning at the visually striking Museum of Contemporary Art and gain an appreciation of contemporary art’s impact, with optional hands on “Great Create” experience. 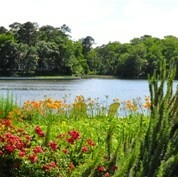 The Norfolk Botanical Gardens features a relaxing trackless tram ride through acres of blooming flora and fauna. Late afternoon free time at Town Center for boutique shopping and dinner on your own followed by an exciting performance at the intimate Sandler Center, with optional behind the scenes or Backstage Broadway experience. Experience the hip vibe in downtown Norfolk – visit one of the top twenty museums in the country, the Chrysler Museum of Art. Get up close and personal with the artists in the Perry Glass Studio as you witness actual glass blowing demonstrations. Enjoy free time at MacArthur Center for lunch on your own and shopping, followed by a yummy chocolate tasting at one of the gourmet shops. Tour the Hermitage Foundation Museum which features a Tudor style mansion and lush, manicured gardens. A stop at Doumar’s Ice Cream family owned drive inn will be sure to satisfy your sweet tooth as you enjoy a treat created on the world’s first ice cream cone machine circa 1904! Dinner tonight in downtown Norfolk at one of the local’s favorites followed by Virginia Arts Festival performance. Following breakfast depart for home with fond memories of your Springtime getaway at the beach and beyond! Includes: 3 or 4 nights, Breakfast each morning, 1 Dinner at hotel, Featured local restaurants, Featured attractions, Featured add-on activities, Your choice of optional activities; Professional Guide service. Ask about Live the Life Adventures in Virginia Beach! Offer subject to change based on availability and dates selected. Black-out dates may apply. Other restrictions may apply. For additional itinerary planning assistance contact your local professional tour operator or we can provide referrals and further assistance through a local professional receptive operator. The Oceanfront Inn | 2901 Atlantic Avenue, Virginia Beach, VA 23451 | Toll Free 888.826.2326 | © Copyright 2019 | Branding & Website Design by Red Chalk Studios, Inc.